Induction of glucocorticoid-induced leucine zipper (GILZ) by glucocorticoids plays a key role in their anti-inflammatory action. In activated macrophages, GILZ levels are downregulated via tristetraprolin-mediated GILZ mRNA destabilization. To assess the functional significance of GILZ downregulation, we generated myeloid-specific GILZ knockout (KO) mice. 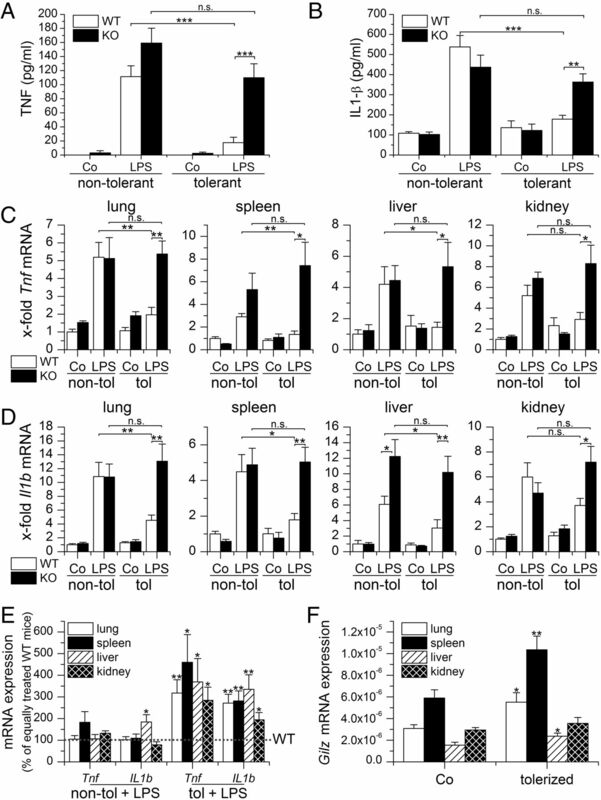 GILZ-deficient macrophages displayed a higher responsiveness toward LPS, as indicated by increased TNF-α and IL-1β expression. This effect was due to an activation of ERK, which was significantly amplified in GILZ KO cells. The LPS-induced activation of macrophages is attenuated upon pretreatment of macrophages with low-dose LPS, an effect termed endotoxin tolerance. In LPS-tolerant macrophages, GILZ mRNA was stabilized, whereas ERK activation was strongly decreased. In contrast, GILZ KO macrophages exhibited a strongly reduced desensitization. To explore the contribution of GILZ expression in macrophages to endotoxin tolerance in vivo, we treated GILZ KO mice with repeated i.p. injections of low-dose LPS followed by treatment with high-dose LPS. LPS pretreatment resulted in reduced proinflammatory mediator expression upon high-dose LPS treatment in serum and tissues. In contrast, cytokine induction was preserved in tolerized GILZ KO animals. In summary, our data suggest that GILZ is a key regulator of macrophage functions. Glucocorticoid (GC)-induced leucine zipper (GILZ, TSC22D3) is rapidly induced by treatment with GCs and acts as an anti-inflammatory regulator by binding to various signaling molecules, thereby inhibiting their activation. Examples include NF-κB and AP-1 (1–4). GILZ was first isolated as a dexamethasone-responsive gene from a thymus subtraction library (5). It is widely expressed in many tissues, such as lung, spleen, liver, kidney, brain, heart, and skeletal muscle, as well as in a variety of cells such as macrophages, T lymphocytes, and endothelial cells (1, 3, 4, 6, 7). GILZ is essential for many therapeutically relevant actions of GCs (2, 8, 9). The protective actions of a GILZ fusion protein from colitis (10) and of a GILZ peptide mimic from autoimmune encephalomyelitis (11) also promote the concept of GILZ as a key regulator in inflammation. In addition, endogenous GILZ has been suggested to be an anti-inflammatory mediator in arthritis, as depleting GILZ expression in vivo increased the clinical and histological severity of collagen-induced arthritis in mice and enhanced synovial expression of TNF-α and IL-1 (12). GILZ is downregulated in epithelial and endothelial cells by inflammatory cytokines (3, 13) and in alveolar macrophages (AMs) via TLR activation (4). In accordance, GILZ expression is reduced or even absent in various inflammatory disorders, such as chronic rhinosinusitis, Crohn's disease, tuberculosis, and atherosclerosis (3, 14, 15), indicating that suppression of GILZ expression might be a general phenomenon in inflammatory diseases. Macrophages are the major source of human GILZ (4, 6, 14). Functional skewing of mononuclear phagocytes occurs in vivo under physiological and in pathophysiological conditions, for example, infection and cancer (16, 17). After exposure to the bacterial cell-wall component LPS, macrophages switch into a refractory state, designated as endotoxin or LPS tolerance. LPS-tolerant macrophages are characterized by a reduced secretion of proinflammatory cytokines, upregulation of anti-inflammatory genes, and increased phagocytosis (18, 19). Monocytes and macrophages are the principal cells responsible for the induction of LPS tolerance in vivo. Clinically, tolerance to LPS usually occurs after an initial inflammatory response during the late phases of sepsis and allows the LPS-tolerant host to survive an otherwise lethal secondary LPS challenge. However, tolerance-associated immunosuppression may increase the risk for secondary infections, as indicated by the increase of positive blood cultures for typically opportunistic bacteria (18–21). The molecular mechanisms underlying LPS tolerance remain elusive, although defects in TLR4 signaling at the level of receptor, signaling molecules, and transcription factors have been reported (18, 19). Considering the high expression and dynamic regulation of GILZ in macrophages, this study aimed to elucidate the regulation and functional role of GILZ in macrophage activation and to explore its contribution to the establishment of endotoxin tolerance both in vitro and in vivo. Cell media, FCS, charcoal-stripped FCS, human serum, penicillin, streptomycin, and glutamine were from Sigma-Aldrich. Pam3CSK4 and ultrapure LPS from Escherichia coli K12 used in in vitro experiments and from Salmonella minnesota R595 for in vivo testing were purchased from Invivogen. The Amaxa Human Macrophage Nucleofector Kit and the Nucleofector II device were obtained from Lonza. The pGL4.32(luc2P/NF-κB–responsive elements [RE]/Hygro) vector, the pRL-TK vector, and 5× passive lysis buffer were from Promega; the 3xAP1pGL3 vector (22) was obtained from Addgene. Polyclonal rabbit anti-GILZ and anti-tristetraprolin (anti-TTP) Abs and the anti–α-tubulin mAb (DM1A) were obtained from Sigma-Aldrich. Phospho-SAPK/JNK (Thr183/Tyr185) (G9) mouse mAb, phospho-p44/42 MAPK (Thr202/Tyr204) 20G11 rabbit mAb, p44/42 (Erk1/2) (L34F12) mouse mAb, phospho-Raf1-(Ser338) (56A6) rabbit mAb, and phospho-p38 MAPK (Thr180/Tyr182) (3D7) rabbit mAb were from Cell Signal Technology. IRDye 680– or IRDye 800–conjugated secondary Abs were from LI-COR Biosciences. PE-labeled anti-TLR4 (UT41) and PE-IgG1κ were obtained from eBioscience; PE–anti-CD68 (Y1/82A), PE–anti-F4/80, PE-IgG2b, and REA Control-PE were from Miltenyi Biotec. Restriction enzymes were obtained from New England Biolabs. Other chemicals were purchased from either Sigma-Aldrich or Carl Roth unless stated otherwise. Mice were housed in a 12/12 h light/dark cycle with food and water ad libitum. B6.129P2-Lyz2tm1(cre)Ifo/J mice (The Jackson Laboratory) were crossed with C57BL/6J mice bearing LoxP sites upstream and downstream of Gilz exon 6 (23) to obtain myeloid-specific Gilz knockout (KO) mice. Genotyping was performed according to protocols provided by The Jackson Laboratory and as described by Bruscoli et al. (23). Because the Gilz gene is located on the X chromosome, crossing of females homozygous for the Cre transgene, but heterozygous for the LoxP flanked Gilz gene, with Cre homozygous males allowed the breeding of male wild type (WT) and KO littermates. To explore the contribution of GILZ expression in macrophages to endotoxin tolerance in vivo, we treated male WT and KO mice aged 10–12 wk (22–25 g body weight) with repeated i.p. injections of low-dose LPS (10 μg/mouse dissolved in 0.9% NaCl) or vehicle alone for 3 consecutive days, followed by treatment with high-dose LPS (100 μg/mouse) or vehicle. All injections were done between 8 am and 9 am to minimize the influence of the circadian GC rhythm. Mice were sacrificed 4 h after the final injection. Tissues and sera were collected and stored at −80°C until further use. All animal procedures were performed in accordance with the local animal welfare committee (permission no. 35/2013). AMs were isolated from human nontumor lung tissue obtained from patients undergoing lung resection. The use of human material for isolation of primary cells was reviewed and approved by the local Ethics Committees (permission no. 213/06; State Medical Board of Registration, Saarland, Germany). The informed consent of all participating subjects was obtained. Isolation was performed according to a previously described method (24). After visible bronchi were removed, the lung tissue was chopped and washed with balanced salt solution (137 mM NaCl, 5 mM KCl, 0.7 mM Na2HPO4, 10 mM HEPES, 5.5 mM glucose, pH 7.4). Subsequently, cells were obtained by centrifugation (15 min, 350 × g). Remaining erythrocytes were lysed by incubation with hypotonic buffer (155 mM NH4Cl, 10 mM KHCO3, 1 mM Na2EDTA). Cells were resuspended in AM medium (RPMI 1640, 5% FCS, 100 U/ml penicillin G, 100 μg/ml streptomycin, 2 mM glutamine), seeded at a density of 0.5–1 × 106 cells/well in a 12- or 6-well plate, and incubated at 37°C and 5% CO2 for 2 h. Adherent cells were thoroughly washed with PBS (137 mM NaCl, 2.7 mM KCl, 10.1 mM Na2HPO4, 1.8 mM KH2PO4, pH 7.4) and cultivated for 3–4 d. AMs were found >95% pure as judged by flow-cytometric analysis (FACSCalibur; Becton Dickinson) using an Ab against CD68. Bone marrow–derived macrophages (BMMs) were obtained from 8- to 12-wk-old male WT or GILZ KO mice, preferably littermates, according to a previously published method (25) with minor modifications. In brief, femurs and tibias were flushed with standard medium (RPMI 1640, 10% FCS, 100 U/ml penicillin G, 100 μg/ml streptomycin, 2 mM glutamine). Erythrocytes contained in the cell pellet after centrifugation were lysed with hypotonic buffer. Cells were resuspended in standard medium supplemented with M-CSF (50 ng/ml; Biomol), transferred into a 75-cm2 culture flask, and allowed to adhere overnight. Nonadherent cells were transferred into a 150-cm2 culture flask and cultivated for another 5 d in M-CSF–containing medium. Subsequently, cells were detached with Accutase (Sigma), suspended in standard medium with 10 ng/ml M-CSF, and seeded at a density of 75 × 105 cells for TNF-α quantification or 0.25 × 106 cells/well in a 24-well or 0.5 × 106 cells in a 12-well plate for all other applications. Alternatively, BMMs were resuspended in GC-depleted medium (RPMI 1640, 10% charcoal-stripped FCS, 100 U/ml penicillin G, 100 μg/ml streptomycin, 2 mM glutamine) and seeded accordingly. BMMs were found to be >95% pure as indicated by flow-cytometric analysis using an Ab against F4/80. MPI cells, that is, nontransformed self-renewing primary murine macrophages, were obtained from C57BL/6 mice based on a method described by Fejer et al. (26). In brief, MPI cells were prepared from fetal livers of 15-d-old mouse embryos. Liver single-cell suspensions were prepared by pushing the tissue through 70-μm cell strainers while washing with PBS. Cells were washed in PBS and resuspended in standard medium (RPMI 1640, 10% FCS, 100 U/ml penicillin G, 100 μg/ml streptomycin, 2 mM glutamine) supplemented with 30 ng/ml murine GM-CSF (Biomol). Proliferating cells were subcultured by splitting them 1:5 after 6–8 d.
L929, RAW 264.7, and THP-1 cells (American Type Culture Collection) were cultivated in standard medium (RPMI 1640, 10% FCS, 100 U/ml penicillin G, 100 μg/ml streptomycin, 2 mM glutamine). For culture of stably transfected shTTP and shLuc THP-1 cells, zeocin (100 μg/ml; Invivogen) was added to the medium. THP-1 cells were transferred into a 12-well plate (0.5 × 106 cells/well) and differentiated with 100 nM PMA for 48 h before further treatment (25). To ensure the use of nontoxic concentrations of RU486, PD98059, and U0126, the MTT colorimetric assay was performed as described previously (27, 28). Absorbance measurements were calculated at 550 nm with 630 nm as the reference wavelength using a microplate reader (Tecan Sunrise). The cell viability index obtained from at least two independent experiments was calculated relative to untreated controls (data not shown). Staining was essentially performed as described previously (24, 25). In brief, cells were detached from the plates in TEN buffer (40 mM Tris, 1 mM EDTA, 150 mM NaCl) before staining. For extracellular staining of TLR4 and F4/80, cells were washed with PBS, resuspended in flow cytometry buffer (FCB; PBS containing 2.5% [v/v] bovine calf serum and 0.05% [w/v] NaN3). A total of 0.5 × 106 cells were incubated with equal amounts (0.25–1 μg in 100 μl) of a specific or isotype control Ab for 30 min on ice. The cells were washed in FCB and resuspended in 1% (w/v) cold paraformaldehyde in PBS, pH 7.6. To detect intracellular TLR4 or CD68, we fixed the washed cells for 10 min in 1% (w/v) paraformaldehyde in PBS, pH 7.6, and then stained them in saponin buffer (SAP; FCB with 0.2% [w/v] saponin) after permeabilization for 10 min in SAP and blocking for 30 min in 10% (v/v, diluted in SAP) human AB serum (PAA). The stained cells were examined on a FACSCalibur, and results were analyzed using the CellQuest software (BD Biosciences). Results are reported as relative mean fluorescence intensity (RMFI; MFI of specifically stained cells related to MFI of isotype control). ELISA was performed using the TNF Mouse ELISA Kit (Life Technologies) or the IL-1 β Mouse ELISA Kit (Abcam) according to the manufacturers’ instructions. Absorption measurements were carried out using the GloMax Discover Multimode Detection System (Promega). Alternatively, TNF-α was measured by L929 cytotoxicity bioassay as described previously (27, 28). In brief, L929 cells were seeded at a density of 3 × 104 cells/well into a 96-well microplate. After 24 h, medium was replaced by actinomycin D solution (1 μg/ml in standard medium). After 1 h of preincubation with actinomycin D, BMM supernatants were added. Standards, that is, recombinant murine TNF-α (100–2500 pg/ml; Biomol) in standard medium, were run alongside the samples to generate a standard curve. The plates were incubated for an additional 24 h at 37°C. The mitochondrial reduction of MTT to formazan was determined as an indicator of cell viability. Cells were suspended in lysis buffer (50 mM Tris-HCl, 1% (m/v) SDS, 10% (v/v) glycerol, 5% (v/v) 2-ME, 0.004% (m/v) bromphenol blue) supplemented with a protease inhibitor mixture (Complete; Roche Diagnostics) as described previously (4) and stored at −80°C until further use. After sonication, lysates were boiled for 5 min at 95°C. Subsequently, the samples were separated by SDS-PAGE on 12–15% gels and transferred to Immobilon FL-PVDF membranes (Millipore). The membranes were blocked in blocking buffer for near-infrared Western blotting (Rockland) for 1 h and cut into pieces before Ab incubation. The use of a prestained marker allowed the localization of the area of interest. Subsequently, blots were incubated with primary Ab dilutions for 3 h at room temperature or at 4°C overnight and with IRDye 680 or IRDye 800 conjugated secondary Abs for 1.5 h as reported previously (4, 25). After washing, blots were scanned with an Odyssey Infrared Imaging System (LI-COR Biosciences) and relative protein amounts were determined using either Odyssey or ImageJ software. The short hairpin RNA plasmid termed shTTP encoding a small interfering RNA (siRNA) directed against the human TTP mRNA were created by cloning a double-stranded oligonucleotide (5′-ACC TCG GGA TCC GAC CCT GAT GAA TAT CAA GAG TAT TCA TCA GGG TCG GAT CCC TT-3′) into the BbsI sites of psiRNA-h7SKGFPzeo (4). Plasmid DNA for transfections was purified from overnight E. coli GT116 (Invivogen) cultures with the EndoFree Plasmid Maxi plasmid isolation kit (Qiagen). The shTTP and shLuc control vector (Invivogen) were introduced into THP-1 cells by using the Amaxa Human Macrophage Nucleofector Kit as recommended by the supplier. BMMs were cotransfected with 0.4 μg pGL4.32(luc2P/NF-κB-RE/Hygro) or 3xAP1pGL3 and 0.1 μg pRL-TK per well in a 24-well plate using jetPEI macrophage (Polyplus Transfections) according to the manufacturer’s instructions. Total RNA was extracted using either the RNeasy mini kit (Qiagen), the High Pure RNA isolation kit (Roche), or the High Pure RNA tissue kit (Roche). Five hundred nanograms of total RNA was reversely transcribed in a total volume of 20 μl using the High-Capacity cDNA Reverse Transcription Kit (Applied Biosystems) according to the manufacturer’s instructions. The CFX96 Touch Real-Time PCR Detection System (Bio-Rad) was used for real-time RT-PCR. Primers and dual-labeled probes were obtained from Eurofins MWG Operon. Sequences are given in Table I. Standards, from 60 to 0.00006 attomole of the PCR product cloned into pGEMTeasy (Promega), were run alongside the samples to generate a standard curve. All samples and standards were analyzed in triplicate. For human TNF, CXCL10, GILZ, and ACTB, the PCR mix consisted of 10× PCR buffer (GenScript), either 2 or 8 mM dNTPs (GenScript), 3–9 mM Mg2+, 500 nM sense and antisense primers, either 2.5 or 1.5 pmol of the respective dual-labeled probe, and 2.5 U Taq DNA Polymerase (GenScript) in a total volume of 25 μl (4, 24, 29). The reaction conditions were 95°C for 8 min followed by 40 cycles of 15 s at 95°C, 15 s at a reaction-dependent temperature varying from 57°C to 60°C, and 15 s at 72°C. Murine transcripts were detected using the 5× HOT FIREPol EvaGreen qPCR Mix Plus (Solis BioDyne) according to the manufacturer’s instructions. To avoid detection of truncated transcripts, we used exon 6–specific primers whenever Gilz mRNA expression levels in WT mice were compared with KO mice. The starting amount of cDNA in each sample was calculated using the CFX96 Touch software package (Bio-Rad). For reporter gene assays, vectors containing NF-κB–RE or AP-1–RE driving firefly luciferase expression were used. The pRL-TK vector provided constitutive expression of renilla luciferase and served as an internal control value to which expression of the firefly luciferase reporter gene was normalized. BMMs were cotransfected with either the pGL4.32[luc2P/NF-κB–RE/Hygro] (5 × NF-κB–RE) or 3xAP1pGL3 (3 × AP-1–RE) and the pRL-TK vector. Cells were treated as indicated and harvested by addition of 1× passive lysis buffer. Luciferase activity was determined by addition of firefly luciferase substrate (470 μM d-luciferin, 530 μM ATP, 270 μM CoA, 33 mM DTT, 20 mM tricine, 2.67 mM MgSO4, and 0.1 mM EDTA, pH 7.8) or renilla substrate solution (0.1 M NaCl, 25 mM Tris-HCl pH 7.5, 1 mM CaCl2, 1 μM coelenterazine), followed by luminescence measurement using a POLARstar OPTIMA luminometer (BMG Labtech) as described previously (3, 4). In general, each experiment was performed at least three times and at least two biological replicates were analyzed for all in vitro experiments unless otherwise indicated. In vivo experiments were conducted with n = 9–12 animals per treatment group and genotype. Data are presented as means + SEM. Means of two groups were compared with nonpaired two-tailed Student t test whenever data were distributed normally, and via the Wilcoxon signed rank test whenever not distributed normally. Statistical significance was set at p < 0.05, p < 0.01, or p < 0.001. Data analysis was performed using Origin software (OriginPro 8.6G; OriginLabs). We previously reported that GILZ is downregulated in primary human AMs by TLR4 activation (4). In this article, we show that the suppression of Gilz mRNA expression upon LPS treatment (100 ng/ml) for up to 8 h also occurs in other types of macrophages, such as murine BMMs, the murine macrophage-like cell line RAW264.7, and nontransformed self-renewing primary murine macrophages (MPI cells; Fig. 1A). GILZ downregulation promotes the inflammatory response in macrophages. (A) AMs, BMMs, RAW264.7, and MPI cells were treated for up to 8 h with LPS (100 ng/ml), and GILZ/Gilz mRNA levels were quantified and normalized to ACTB (AMs) or Rn18s (BMMs, RAW 264.7, MPI). Untreated controls were set as 100%, and data are expressed as mean + SEM (AMs, BMMs: n = 3, duplicates; RAW, MPI: n = 2, triplicates); *p < 0.05, **p < 0.01, ***p < 0.001 compared with untreated controls. (B) GILZ protein expression in BMMs from WT and KO mice (n = 4) was examined by Western blot analysis. Tubulin was used as a loading control. (C) Gilz mRNA expression in BMMs and tissues from WT and KO mice. Gilz mRNA levels were quantified and normalized to Rn18s. The mean of the values obtained for WT BMMs were set as 100%, and data are presented as means + SEM (n = 4, duplicates); *p < 0.05. (D) NF-κB and AP-1 activities in LPS-stimulated BMMs were measured by luciferase reporter gene assay. Cells were either left untreated or incubated with LPS for 4 h at the indicated concentrations 20 h after transfection. Relative luminescence values for KO BMMs are expressed as percentage of equally treated WT BMMs. Data show means + SEM (n = 4, sextuplicates). *p < 0.05, **p < 0.01, ***p < 0.001 compared with equally treated WT cells. (E–H) BMMs were treated with 100 ng/ml LPS for up to 24 h (E and F) or with LPS for 2 h at the indicated concentrations (G and H). Il1b mRNA levels (E and G) were determined by real-time RT-PCR, normalized to Rn18s, and expressed as x-fold of untreated WT BMMs (n = 4, duplicates). (F and H) TNF was quantified by bioassay (n = 4, triplicates). Data represent means ± SEM. *p < 0.05, **p < 0.01, ***p < 0.001 compared with equally treated WT cells. The p values were generated by Student t test. To explore the functional significance of GILZ downregulation in macrophages, we generated myeloid-specific GILZ KO mice using the Cre/loxP-system. The absence of GILZ in bone marrow–derived KO macrophages was confirmed on both mRNA and protein level (Fig. 1B, 1C). Our approach also revealed that macrophages considerably contribute to the overall Gilz mRNA expression in lung, spleen, and liver tissue (Fig. 1C). BMMs obtained from GILZ KO mice displayed a higher responsiveness toward LPS, as shown by enhanced NF-κB and AP-1 activity after LPS exposure (Fig. 1D). GILZ deletion also resulted in an increased upregulation of IL1b mRNA and prolonged TNF-α secretion in GILZ KO versus WT macrophages treated with LPS (100 ng/ml) for up to 24 h (Fig. 1E, 1F). In contrast, LPS-induced Il10 mRNA production was not altered in GILZ KO cells (Supplemental Fig. 1). LPS-induced Il1b mRNA levels were elevated by GILZ depletion over a wide range of LPS concentrations, starting at as little as 1 ng/ml LPS up to 2500 ng/ml for 2 h (Fig. 1G). As for TNF-α, the effect of GILZ KO was found to be restricted to lower LPS concentrations (Fig. 1H). 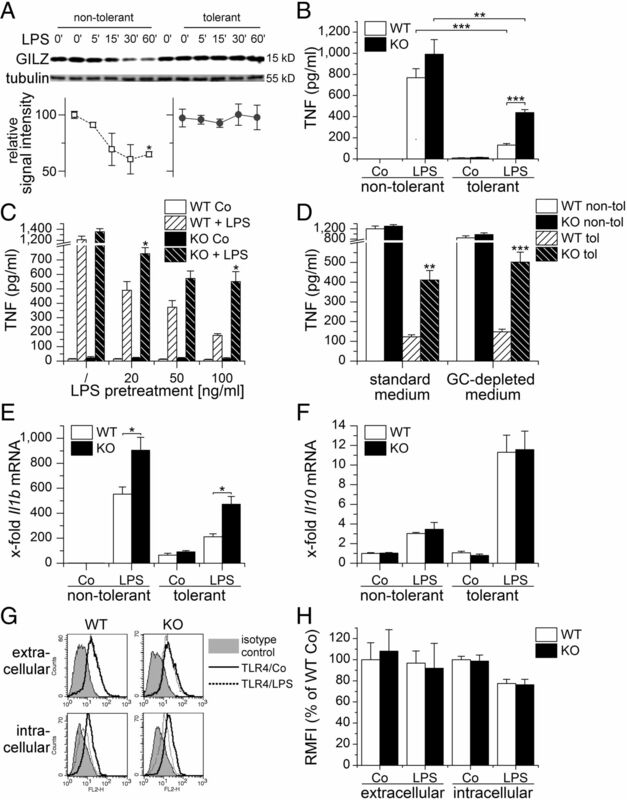 Because GILZ KO did not affect intracellular or extracellular TLR4 expression levels (Fig. 2A, 2B), we sought to check for alterations in TLR4 downstream pathways. GILZ modulates the inflammatory response via the ERK pathway. (A and B) BMMs were left untreated or treated with LPS (1 μg/ml) for 4 h. Extracellular and intracellular TLR4 expression was measured by flow cytometry. (A) Representative histograms are shown. (B) RMFIs obtained for untreated WT cells were set as 100%. Data are expressed as means + SEM (n = 4, duplicates). (C–F) BMMs were treated with LPS (100 ng/ml) for up to 60 min. Raf1 and ERK phosphorylation were examined by Western blot analysis. (C) One representative blot is shown. (D–F) Signal intensities were quantified, normalized to the indicated loading controls, and expressed as x-fold of untreated WT cells. Data represent means ± SEM (n = 4). *p < 0.05 compared with equally treated WT BMMs. (G and H) MKP-1 expression in BMMs treated with LPS (100 ng/ml) for the indicated time points was analyzed by Western blot. Tubulin served as a loading control. (G) One representative blot is shown. (H) MKP-1 signal intensities were quantified and are expressed as percentage of 0’ values. Data represent means + SEM (n = 4, duplicates). (I and J) BMMs were pretreated with PD98059 (10 μM), U0126 (10 μM), or vehicle (0.1% DMSO) for 2 h, followed by addition of LPS at the indicated concentrations for 4 h. Il1b mRNA expression (I) was determined by real-time RT-PCR, normalized to Rn18s, and expressed as x-fold of untreated WT BMMs. (J) TNF was measured by bioassay. Data represent means + SEM (n = 2, triplicates); *p < 0.05, **p < 0.01. The p values were calculated by Student t test. GILZ has been suggested to modulate MAPK signaling in various cell types (3, 7, 8, 23, 30, 31). Therefore, we examined LPS-induced p38, JNK, and ERK activation in WT and GILZ KO cells. LPS-mediated ERK activation was indeed significantly enhanced in GILZ KO macrophages, whereas neither p38 nor JNK signaling were affected by the loss of GILZ (Fig. 2C–F and data not shown). In accordance, phosphorylation of the ERK upstream regulator Raf1, which has previously been reported to be inhibited by GILZ via direct binding (8, 32), was markedly prolonged in GILZ KO cells. MAPKs can be inactivated via dephosphorylation by MAPK phosphatase-1 (MKP-1, also known as dual-specific phosphatase DUSP-1). Because GILZ expression has been suggested to positively correlate with MKP-1 levels (7, 30), LPS-induced MKP-1 expression in GILZ KO and WT macrophages was examined. However, the extent of MKP-1 induction in equally treated WT and GILZ KO macrophages was similar (Fig. 2G, 2H), indicating that GILZ depletion affects ERK signaling mainly via loss of GILZ-associated Raf1 inhibition. These observations suggested that elevated ERK activity might play a role in increased cytokine expression concomitant with GILZ KO. We found indeed that inhibition of ERK repressed the induction of IL1b mRNA upon LPS challenge in both WT and KO macrophages (Fig. 2I). Interestingly, ERK inhibition influenced the secretion of TNF-α at low, but not at high, concentrations of LPS, thereby mirroring the general influence of GILZ KO on TNF-α production (Fig. 2H). We then examined GILZ expression in a state of LPS hyporesponsiveness, that is, LPS tolerance. To this end, human AMs were preincubated with LPS (100 ng/ml) for 24 h before rechallenge with a higher dose of LPS (1 μg/ml) for 2–4 h. As expected, the induction of proinflammatory mediators, that is, TNF or CXCL10 mRNA, was abrogated in tolerant cells (Fig. 3A). 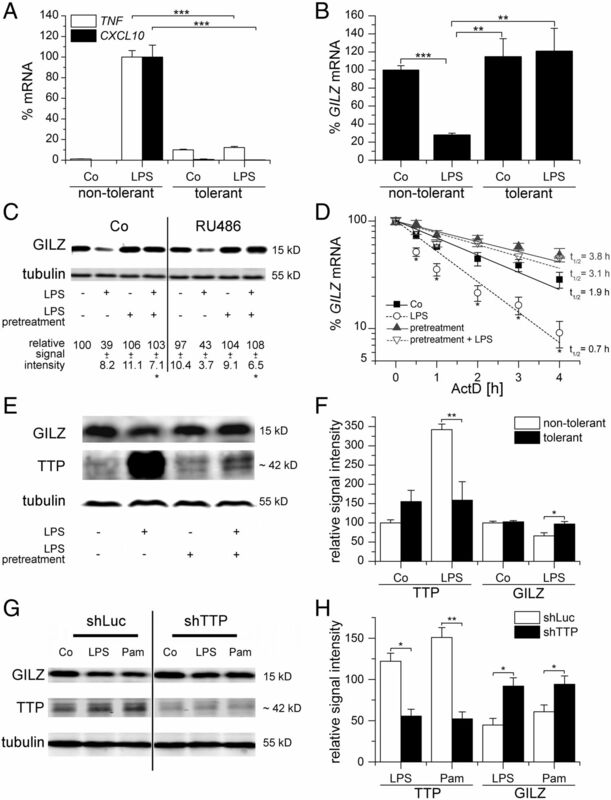 In parallel, LPS-induced GILZ mRNA downregulation was absent in LPS-tolerized AMs (Fig. 3B). Similar effects were observed when we examined GILZ protein levels. Increased GILZ levels were not associated with GC receptor activation, because GC receptor inhibition had no effect on GILZ levels (Fig. 3C). GILZ expression is stabilized in LPS-tolerant macrophages. (A–F) AMs were tolerized to LPS by LPS pretreatment (100 ng/ml) for 24 h. (A and B) Nontolerant and tolerant AMs were stimulated with LPS (1 μg/ml) for 2 h. TNF, CXCL10 (A), and GILZ (B) mRNA expression levels were quantified by real-time RT-PCR and normalized to ACTB. Data represent means + SEM and are expressed as percentage of (A) LPS-induced expression in nontolerant cells or (B) untreated controls (n = 3, triplicates). (C) Naive and tolerant AMs were incubated with vehicle (0.1% EtOH, Co) or RU486 for 0.5 h before rechallenge with LPS (1 μg/ml, 4 h). GILZ expression was analyzed by Western blotting using tubulin as a loading control. One representative blot is shown. GILZ signal intensities (bottom) were quantified and normalized to tubulin. Data represent means ± SEM (n = 3, duplicates); *p < 0.05 compared with LPS-treated nontolerant AMs. (D) Nontolerant and tolerant AMs were pretreated with LPS (1 μg/ml) for 0.5 h, followed by actinomycin D addition (10 μg/ml). RNA was isolated at the indicated time points, and real-time RT-PCR analysis for GILZ was performed. Data are normalized to ACTB and represent means ± SEM (n = 3, triplicates). Curve fitting and mRNA half-life calculations were done using Origin software; *p < 0.05 compared with values for AMs treated with actinomycin D only (Co) at the indicated time point. (E and H) LPS-tolerized or naive AMs were either left untreated or treated with LPS (1 μg/ml, 4 h), and GILZ and TTP expression were examined by Western blot analysis. (E) One representative blot is shown. (F) Signal intensities were quantified and normalized to tubulin. Relative signal intensities for nontolerant Co samples were set as 100%. Data represent mean + SEM (n = 3, duplicates). (G and H) THP-1 macrophages stably transfected with an shTTP or control (shLuc) vector were either left untreated (Co) or treated with LPS or Pam3CSK4 (1 μg/ml) for 4 h, and TTP and GILZ expression were analyzed by Western blotting. (G) Data show one representative experiment. (H) Relative TTP and GILZ signal intensities were quantified and normalized to tubulin values. Data are expressed as percentage of Co values and show means + SEM (n = 2, triplicates). The p values were generated by Student t test: *p < 0.05, **p < 0.01, ***p < 0.001. Instead, GILZ mRNA stability was considerably increased in tolerant AMs (Fig. 3D). In nontolerant cells, LPS treatment reduced GILZ mRNA stability, which was paralleled by induction of the mRNA binding protein TTP. In contrast, LPS-tolerant cells were not able to induce TTP upon re-exposure to LPS (Fig. 3E, 3F). TTP was previously suggested to be involved in GILZ mRNA destabilization in monocytic THP-1 cells (4). Accordingly, THP-1 macrophages bearing a stable TTP knockdown were unable to downregulate GILZ (Fig. 3G, 3H), indicating that TTP induction is a prerequisite for GILZ downregulation via destabilization of its mRNA. As previously seen in AMs, LPS tolerance in WT BMMs resulted in a stabilized expression of GILZ upon re-exposure to LPS, which was paralleled by a diminished expression of proinflammatory mediators, such as TNF-α and Il1b mRNA (Fig. 4A–E). In contrast, GILZ KO macrophages displayed reduced LPS tolerance, as indicated by increased TNF-α and Il1b production when compared with equally treated WT cells (Fig. 4B–E). The attenuated LPS tolerance in GILZ KO macrophages did not depend on GCs contained in cell culture media, because LPS-tolerized macrophages cultured in GC-depleted medium did not behave any differently compared with cells kept in standard medium (Fig. 4D). GILZ KO attenuates LPS tolerance in BMMs. (A–F) BMMs were tolerized to LPS by LPS pretreatment (100 ng/ml) for 24 h. (A) Nontolerant and tolerant WT BMMs were treated with LPS (1 μg/ml) for the indicated time points. GILZ signal intensities were normalized to tubulin and are expressed as percentage of 0’ values obtained for nontolerant cells (n = 4, duplicates); p < 0.05 compared with untreated control. (B–D) Naive and LPS-tolerized WT and KO BMMs were washed and rechallenged with LPS (1 μg/ml, 4 h). TNF was measured in the supernatants by ELISA (B) or bioassay (C and D). Data represent mean + SEM (n = 4, triplicates); *p < 0.05, **p < 0.01, ***p < 0.001 compared with equally treated WT cells or as indicated. Additional LPS pretreatment schemes (C) or culture conditions (D) were included as specified in the figures. (E and F) Nontolerant and tolerant cells were activated with LPS (1 μg/ml, 4 h). Il1b and Il10 mRNA expression levels were determined by real-time RT-PCR, normalized to Rn18s, and expressed as x-fold of untreated nontolerant WT BMMs. Data show means + SEM (n = 4, duplicates); *p < 0.05. (G and H) LPS-tolerized BMMs were left untreated or were rechallenged with LPS (1 μg/ml) for 4 h. Extracellular and intracellular TLR4 expression were measured by flow cytometry. (G) Representative histograms are shown. (H) RMFIs obtained for untreated WT cells were set as 100% and are expressed as means + SEM (n = 4, duplicates). The p values were calculated by Student t test. non-tol, nontolerant; tol, tolerant. As observed in nontolerant BMMs, enhanced LPS responsiveness in GILZ KO cells was not associated with reduced Il10 mRNA levels or with increased TLR4 expression (Fig. 4F–H). 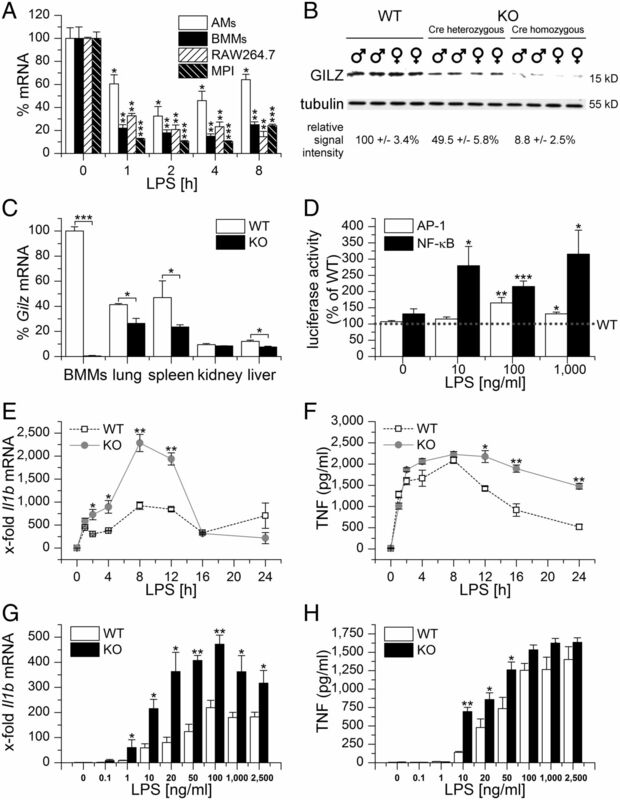 In addition to its effect on cytokine expression, LPS tolerance also resulted in an almost complete abrogation of LPS-induced MAPK activation in WT BMMs, whereas MAPK signaling was preserved in LPS-tolerized GILZ KO BMMs (Fig. 5A–F). Unlike in nontolerant macrophages, GILZ KO not only affected ERK activity, but also p38 and JNK activation. 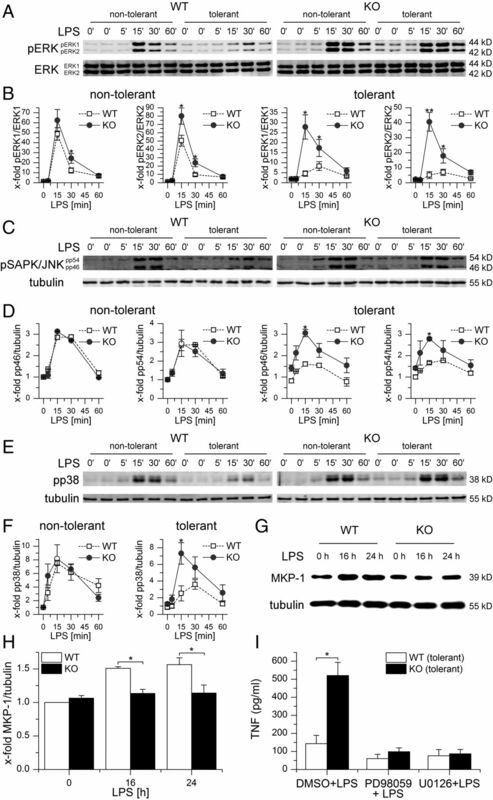 The inhibition of MAPK activity in LPS-tolerant WT macrophages might be, at least in part, due to an induction of MKP-1 upon prolonged exposure to LPS. This response to long-term LPS treatment was missing in GILZ KO cells (Fig. 5G, 5H), which might explain the generalized influence of GILZ depletion on MAPK signaling in LPS-tolerized cells. GILZ KO modulated both ERK activity and MKP-1 expression independently of GCs, because culture in GC-depleted medium led to similar results (Supplemental Fig. 2). GILZ KO rescues MAPK signaling in LPS-tolerant cells. (A–F) WT and KO BMMs were tolerized to LPS by LPS pretreatment (100 ng/ml) for 24 h. Nontolerant and tolerant cells were either left untreated or exposed to LPS (1 μg/ml) for the indicated periods. ERK (A and B), SAPK/JNK (C and D), and p38 (E and F) phosphorylation were examined by Western blot analysis. (A, C, and E) One representative experiment is shown. (B, D, and F) Signal intensities were quantified, normalized to the indicated loading controls, and expressed as x-fold of untreated WT cells. Data represent means ± SEM (n = 4, duplicates); *p < 0.05, **p < 0.01 compared with equally treated WT BMMs. (G and H) MKP-1 expression in BMMs treated with LPS (100 ng/ml) for the indicated time points was analyzed by Western blot. Tubulin served as a loading control. (G) One representative blot is shown. (H) MKP-1 signal intensities were quantified and are expressed as percentage of 0 h values. Data represent means + SEM (n = 4, duplicates); *p < 0.05. (I) BMMs were pretreated with LPS (22 h, 100 ng/ml). PD98059, U0126, or vehicle (0.1% DMSO) was added for 2 h. Subsequently, cells were washed and fresh medium containing the inhibitors or vehicle ± LPS (1 μg/ml) was added. After 4 h, TNF secretion was quantified by bioassay. Data represent means + SEM (n = 4, triplicates); *p < 0.05. The p values were generated by Student t test. 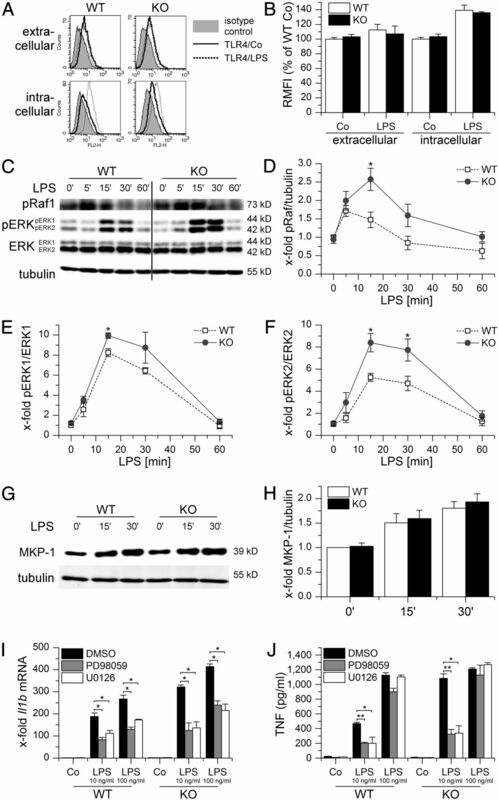 Inhibition of ERK signaling abolished the increased responsiveness of GILZ KO cells toward LPS, indicating that loss of GILZ enhances the inflammatory response in LPS-tolerant cells mainly by modulating ERK activity (Fig. 5I). To examine the in vivo relevance of these findings, we subjected myeloid-specific GILZ KO and WT mice to repeated i.p. injections of low-dose LPS (10 μg/mouse, ∼0.4 mg/kg body weight) for 3 consecutive days, followed by a final high-dose injection of LPS (100 μg/mouse, ∼4 mg/kg body weight) on day 4. Four hours after the final injection, mice were sacrificed and serum as well as lung, spleen, liver, and kidney tissues were analyzed for TNF-α and IL-1β production. LPS pretreatment of WT animals resulted in a significant reduction of serum TNF-α and IL-1β levels upon high-dose LPS treatment (Fig. 6A, 6B). In accordance, LPS tolerance was also observed in lung, spleen, and liver tissues of LPS-tolerized WT animals (Fig. 6C, 6D). In contrast, high-dose LPS-induced cytokine production was preserved in LPS-tolerized GILZ KO animals (Fig. 6A–D). Comparison of Tnf and Il1b mRNA levels in GILZ KO and equally treated WT mice revealed that GILZ does not influence the inflammatory response in tissues of nontolerized mice to a significant degree in our experimental setting (Fig. 6E). In LPS-tolerant animals, however, LPS-induced Tnf and Il1b levels in GILZ KO mice exceeded those measured for WT animals in each tissue type analyzed, suggesting myeloid GILZ expression as a key factor in the establishment and/or maintenance of LPS tolerance. The importance of GILZ for the tolerization process in vivo is further underlined by the finding that Gilz mRNA levels were not only stabilized, but actually induced in LPS-tolerized mice (Fig. 6F). GILZ knockdown in myeloid cells abrogates LPS tolerance in vivo. (A–F) WT and KO mice were subjected to i.p. injections of low-dose LPS (10 μg/mouse, tolerant) or vehicle (nontolerant) on 3 consecutive days, followed by a final treatment with high-dose LPS (100 μg/mouse, 4 h) or vehicle (Co) on day 4. Data are presented as mean + SEM (n = 9–12 per treatment group and genotype); *p < 0.05, **p < 0.01, ***p < 0.001. (A and B) Serum concentrations of TNF (A) and IL-1β (B) were determined by ELISA. (C–F) Tnf (C and E), Il1b (D and E), and Gilz (F) mRNA levels in lung, spleen, liver, and kidney were determined by real-time RT-PCR and normalized to Rn18s. (C and D) Values are expressed as x-fold of nontolerant WT controls. (E) LPS-induced Tnf and Il1b mRNA expression in GILZ KO mice was expressed as percentage of equally WT mice. *p < 0.05, **p < 0.01 compared with WT mice. (F) Gilz mRNA expression levels in tissues of nontolerant (Co) versus tolerized WT mice were normalized to Rn18s. *p < 0.05, **p < 0.01 compared with nontolerized mice. The p values were calculated by Student t test (A and C–F) or Wilcoxon signed rank test (B). non-tol, nontolerant; tol, tolerant. Macrophages are a major component of the mononuclear phagocyte system that includes blood monocytes and tissue macrophages (33). They are capable of many functional activities that contribute to the initiation of a cell-mediated immune response and also act as effectors of inflammation. During the course of their activation, macrophages can display both inflammatory and anti-inflammatory activities. By producing a wide range of biologically active molecules, they participate in the autoregulatory loop in the inflammatory process. Activated macrophages are deactivated in response to various mediators, including IL-10 and GCs (16, 17, 33). Both GCs and IL-10 attenuate inflammation and favor immune tolerance by deactivating macrophages and other APCs. These actions are considered to be mediated to a significant extent via induction of GILZ (1, 8, 14, 34). GILZ impairs inflammation via inhibition of the nuclear translocation of NF-κB and AP-1 by direct binding. In this manner, GILZ decreases the expression of proinflammatory mediators, such as MIP-1α, TNF-α, or IFN-γ, and inhibits TLR2 upregulation (1, 3, 4, 8, 14, 35, 36). GILZ is downregulated in epithelial and endothelial cells by inflammatory cytokines (3, 13) and in AMs upon TLR activation (4). Silencing of GILZ in A549 epithelial cells or endothelial cells results in secretion of significantly higher amounts of inflammatory mediators in response to inflammatory stimuli (36). Likewise, investigations on the functional significance of GILZ downregulation in macrophages performed by siRNA-facilitated GILZ knockdown revealed a proinflammatory response, as indicated by increased cytokine expression and NF-κB activity (4). In this study, we used GILZ KO macrophages to elucidate the influence of GILZ downregulation on the macrophage response to LPS exposure and found that the activity of NF-κB and AP-1 and the production of TNF-α and IL-1β were significantly elevated in these cells. These data collectively suggest suppression of GILZ as a regulatory mechanism in macrophage activation. In addition to its ability to bind to NF-κB and AP-1, GILZ has also been reported to interfere with MAPK signaling (3, 7, 8, 23, 30, 31). MAPKs modulate various physiological cell processes, such as proliferation and apoptosis. However, when activated by proinflammatory stimuli, they also contribute to regulation of proinflammatory transcription factors, thereby amplifying the inflammatory response (37, 38). Macrophage proliferation and activation both require ERK-1/2 phosphorylation. Whereas cellular proliferation is associated with an early peak of ERK-1/2 activity (∼5 min), a later peak (∼15 min) indicates cellular activation (39, 40). Our data show that GILZ deficiency critically influences LPS-induced ERK1/2 activity in macrophages. GILZ has recently been implicated in GC-dependent upregulation of MKP-1 expression in endothelial cells (7) and has been suggested to regulate the expression of MKP-1 and MAPK phosphorylation in macrophages (30). MKP-1 was initially identified as an in vitro ERK-specific phosphatase, but depending on the cell type it can also dephosphorylate other members of the MAPK family, such as JNK and p38, and thus suppress signaling downstream of these kinases (39, 41–44). In our experimental setting, MKP-1 expression and p38 as well as JNK activation were not affected by GILZ depletion, indicating that the absence of GILZ modulates ERK activity mainly via increased Raf1 phosphorylation in an MKP-1–independent manner. A recent report by Fan et al. (30) contrasts our observations by showing that GILZ KO increases both ERK and p38 activation even in nonactivated BMMs, most likely via reduced MKP-1 expression. However, these results may not be directly comparable with this study, because cell culture protocols and treatment schemes were distinctly different. We also observed that enhanced cytokine release in GILZ KO cells was completely abrogated by ERK inhibition. These data support our findings and suggest a previously unreported role for GILZ downregulation in LPS-mediated ERK activation, and hence cytokine induction. Studies showing that TAT-GILZ fusion protein protects against LPS-induced endotoxemia in mice (10) and that LPS resistance in the inbred mouse strain SPRET/Ei is due to GILZ expression (45) further underline the central role of GILZ in the LPS response. Although the regulation and functional significance of GILZ expression in activated macrophages has been addressed previously (4, 14, 30), the contribution of endogenous GILZ to macrophage deactivation is largely unknown. Therefore, we examined the regulation and functional significance of GILZ in LPS tolerance. Endotoxin or LPS tolerance describes the phenomenon that previous exposure to a low level of LPS induces a transient period of hyporesponsiveness to subsequent challenges with LPS. The molecular mechanisms underlying LPS tolerance are not yet fully understood. At the nuclear level, increase in the NF-κB subunit p50 homodimer expression and increased activation of peroxisome proliferator-activated receptors γ have been linked to the tolerance phenotype (18, 19). In addition, microRNAs induced by TLR4 signaling act in a negative feedback fashion, inhibiting various levels of the MyD88 or Toll/IL-1R domain–containing adapter inducing IFN-β signaling pathway (46). We hypothesized that GILZ regulation may be altered in endotoxin tolerance. GILZ downregulation was indeed completely abrogated in LPS-tolerant AMs, most likely because of the inability to induce the mRNA binding protein TTP upon LPS re-exposure. We previously suggested that TTP is critically involved in GILZ downregulation by shortening the half-life of its mRNA (4). In this study, we showed that GILZ mRNA half-life is increased in LPS-tolerant AMs and confirmed the influence of TTP on GILZ expression in stably transfected THP-1 macrophages. Furthermore, we showed that both cytokine induction and MAPK activation were rescued in LPS-tolerized GILZ KO macrophages, indicating that the inability to downregulate GILZ expression contributes to an insufficient immune response in tolerant cells. In fact, the differences observed between WT and GILZ KO macrophages were more obvious in LPS-tolerant than in nontolerant cells, most likely due to the fact that LPS treatment itself results in diminished GILZ expression in nontolerant cells. Thus, it might be difficult to distinguish between the effects of the naturally occurring GILZ downregulation and GILZ KO. In LPS-tolerized cells, however, GILZ downregulation was abrogated and did not mimic GILZ KO effects. In contrast with nontolerant cells, the loss of GILZ did not only affect ERK, but also p38 MAPK and JNK signaling. This might be a result of a distinct MKP-1 expression pattern: whereas GILZ depletion did not influence MKP-1 in nontolerized cells, we observed an MKP-1 induction in WT macrophages upon LPS long-term treatment that is absent in GILZ KO cells. Due to the inability to fully tolerize peritoneal macrophages isolated from MKP-1 null mutant mice, MKP-1 has previously been suggested to be a mediator of LPS tolerance (47). Accordingly, MKP-1 has been reported to protect mice from lethal endotoxic shock (42, 44). Lack of MKP-1 induction and, as a result, enhanced ERK1/2, p38, and JNK activity, might also contribute to the proinflammatory phenotype of tolerized GILZ KO macrophages. However, our data indicate that enhanced ERK1/2 activation is the primary mechanism by which cytokine induction in tolerant GILZ KO cells is, at least partially, preserved. In sepsis and noninfectious systemic inflammatory response syndrome, endogenous corticosteroids are released from the adrenal gland via activation of the hypothalamus-pituitary-axis and have been suggested to contribute to LPS tolerance (18, 48). Locally produced GCs might also add to the overall effect (49). Accordingly, RU486, a known GC receptor antagonist, is capable of inducing a disruption of LPS tolerance in LPS-tolerized mice (50). GILZ has been shown previously to be a critical mediator of GC actions, including inhibition of cytokine induction and MAPK signaling (8, 30, 51). In this study, we show that GILZ is induced in LPS-tolerized mice. Depleting GILZ in myeloid cells, which are the major source of GILZ in different tissues such as the lung (6, 14), but also considerably contribute to the overall GILZ expression in liver and spleen, resulted in an attenuation of LPS tolerance. The suppression of LPS tolerance was even more pronounced than observed in in vitro experiments, suggesting that endogenous GCs might act through GILZ induction to further facilitate LPS tolerance. In summary, we presented evidence that GILZ is required to deactivate macrophages in vitro and in vivo, most likely via its interference with the ERK1/2 pathway. Thus, GILZ might be a potential target for the therapeutic intervention in sepsis and systemic inflammatory response syndrome, both to restrict and to stimulate innate immune responses depending on the stage of the disease. We thank Susanne Renno for excellent technical assistance, Theresa Stadter for help in cell culture setup, Katharina Sauer for help in quantitative PCR, and Eva Dilly for assistance in animal care. This work was supported by the Deutsche Forschungsgemeinschaft (Grant KI702).
. 2009. Glucocorticoid-induced leucine zipper (GILZ): a new important mediator of glucocorticoid action. FASEB J. 23: 3649–3658.
. 2014. Development of novel treatment strategies for inflammatory diseases-similarities and divergence between glucocorticoids and GILZ. Front. Pharmacol. 5: 169.
. 2014. Downregulation of the glucocorticoid-induced leucine zipper (GILZ) promotes vascular inflammation. Atherosclerosis 234: 391–400.
. 2012. Glucocorticoid-induced leucine zipper is downregulated in human alveolar macrophages upon Toll-like receptor activation. Eur. J. Immunol. 42: 1282–1293.
. 1997. A new dexamethasone-induced gene of the leucine zipper family protects T lymphocytes from TCR/CD3-activated cell death. Immunity 7: 803–812.
. 2001. Cloning, chromosomal assignment and tissue distribution of human GILZ, a glucocorticoid hormone-induced gene. Cell Death Differ. 8: 201–203.
. 2013. GILZ overexpression inhibits endothelial cell adhesive function through regulation of NF-κB and MAPK activity. J. Immunol. 191: 424–433.
. 2014. Targeting glucocorticoid side effects: selective glucocorticoid receptor modulator or glucocorticoid-induced leucine zipper? A perspective. FASEB J. 28: 5055–5070.
. 2014. GILZ promotes production of peripherally induced Treg cells and mediates the crosstalk between glucocorticoids and TGF-β signaling. Cell Reports 7: 464–475.
. 2009. Glucocorticoid-induced leucine zipper is protective in Th1-mediated models of colitis. Gastroenterology 136: 530–541.
. 2011. Novel p65 binding glucocorticoid-induced leucine zipper peptide suppresses experimental autoimmune encephalomyelitis. J. Biol. Chem. 286: 44799–44810.
. 2010. Glucocorticoid-induced leucine zipper is an endogenous antiinflammatory mediator in arthritis. Arthritis Rheum. 62: 2651–2661.
. 2007. The anti-inflammatory effect of glucocorticoids is mediated by glucocorticoid-induced leucine zipper in epithelial cells. J. Allergy Clin. Immunol. 119: 115–122.
. 2003. Synthesis of glucocorticoid-induced leucine zipper (GILZ) by macrophages: an anti-inflammatory and immunosuppressive mechanism shared by glucocorticoids and IL-10. Blood 101: 729–738.
. 2009. Chronic rhinosinusitis with and without nasal polyps is associated with decreased expression of glucocorticoid-induced leucine zipper. Clin. Exp. Allergy 39: 647–654.
. 2014. M1 and M2 macrophages: the chicken and the egg of immunity. J. Innate Immun. 6: 716–726.
. 2013. The immunobiology of toll-like receptor 4 agonists: from endotoxin tolerance to immunoadjuvants. Shock 40: 451–462.
. 2008. Monitoring immune dysfunctions in the septic patient: a new skin for the old ceremony. Mol. Med. 14: 64–78.
. 2011. The late phase of sepsis is characterized by an increased microbiological burden and death rate. Crit. Care 15: R183.
. 2002. Repression of AP-1 function: a mechanism for the regulation of Blimp-1 expression and B lymphocyte differentiation by the B cell lymphoma-6 protooncogene. J. Immunol. 169: 1922–1929.
. 2012. Long glucocorticoid-induced leucine zipper (L-GILZ) protein interacts with ras protein pathway and contributes to spermatogenesis control. J. Biol. Chem. 287: 1242–1251.
. 2010. Differential cell reaction upon Toll-like receptor 4 and 9 activation in human alveolar and lung interstitial macrophages. Respir. Res. 11: 124.
. 2009. Attenuated activation of macrophage TLR9 by DNA from virulent mycobacteria. J. Innate Immun. 1: 29–45.
. 2015. Self-renewing macrophages—a new line of enquiries in mononuclear phagocytes. Immunobiology 220: 169–174.
. 2013. Activation of Rac1 GTPase by nanoparticulate structures in human macrophages. Eur. J. Pharm. Biopharm. 84: 315–324.
. 2015. Inhibitory effects of teuclatriol, a sesquiterpene from salvia mirzayanii, on nuclear factor-κB activation and expression of inflammatory mediators. J. Ethnopharmacol. 160: 94–100.
. 2011. Overexpression of the IGF2-mRNA binding protein p62 in transgenic mice induces a steatotic phenotype. J. Hepatol. 54: 994–1001.
. 2014. Macrophage migration inhibitory factor inhibits the antiinflammatory effects of glucocorticoids via glucocorticoid-induced leucine zipper. Arthritis Rheum. (Munch) 66: 2059–2070.
. 2014. Recombinant long-glucocorticoid-induced leucine zipper (L-GILZ) protein restores the control of proliferation in gilz KO spermatogonia. Eur. J. Pharm. Sci. 63: 22–28.
. 2002. Glucocorticoid-induced leucine zipper inhibits the Raf-extracellular signal-regulated kinase pathway by binding to Raf-1. Mol. Cell. Biol. 22: 7929–7941.
. 2014. Homeostasis in the mononuclear phagocyte system. Trends Immunol. 35: 358–367.
. 2006. GILZ expression in human dendritic cells redirects their maturation and prevents antigen-specific T lymphocyte response. Blood 107: 2037–2044.
. 2007. Glucocorticoid-induced leucine zipper (GILZ)/NF-kappaB interaction: role of GILZ homo-dimerization and C-terminal domain. Nucleic Acids Res. 35: 517–528.
. 2010. Ethanol upregulates glucocorticoid-induced leucine zipper expression and modulates cellular inflammatory responses in lung epithelial cells. J. Immunol. 184: 5715–5722.
. 2013. Mitogen-activated protein kinases in innate immunity. Nat. Rev. Immunol. 13: 679–692. 2005. MAPK signalling pathways as molecular targets for anti-inflammatory therapy—from molecular mechanisms to therapeutic benefits. Biochim. Biophys. Acta 1754: 253–262.
. 2012. MKP-1: a critical phosphatase in the biology of macrophages controlling the switch between proliferation and activation. Eur. J. Immunol. 42: 1938–1948.
. 2000. The differential time-course of extracellular-regulated kinase activity correlates with the macrophage response toward proliferation or activation. J. Biol. Chem. 275: 7403–7409.
. 2006. Antiinflammatory effects of dexamethasone are partly dependent on induction of dual specificity phosphatase 1. J. Exp. Med. 203: 1883–1889.
. 2006. Dual specificity phosphatase 1 (DUSP1) regulates a subset of LPS-induced genes and protects mice from lethal endotoxin shock. J. Exp. Med. 203: 15–20.
. 2002. Inhibition of p38 MAPK activation via induction of MKP-1: atrial natriuretic peptide reduces TNF-alpha-induced actin polymerization and endothelial permeability. Circ. Res. 90: 874–881.
. 2006. MAP kinase phosphatase 1 controls innate immune responses and suppresses endotoxic shock. J. Exp. Med. 203: 131–140.
. 2013. LPS resistance of SPRET/Ei mice is mediated by Gilz, encoded by the Tsc22d3 gene on the X chromosome. EMBO Mol. Med. 5: 456–470.
. 2011. MicroRNA in TLR signaling and endotoxin tolerance. Cell. Mol. Immunol. 8: 388–403.
. 2009. Gene-specific control of the TLR-induced inflammatory response. Clin. Immunol. 130: 7–15.
. 2010. TNF suppresses acute intestinal inflammation by inducing local glucocorticoid synthesis. J. Exp. Med. 207: 1057–1066.
. 2010. Differential effects of glucocorticoids in the establishment and maintenance of endotoxin tolerance. Clin. Exp. Immunol. 159: 208–216.
. 2012. Targeting the side effects of steroid therapy in autoimmune diseases: the role of GILZ. Discov. Med. 13: 123–133.